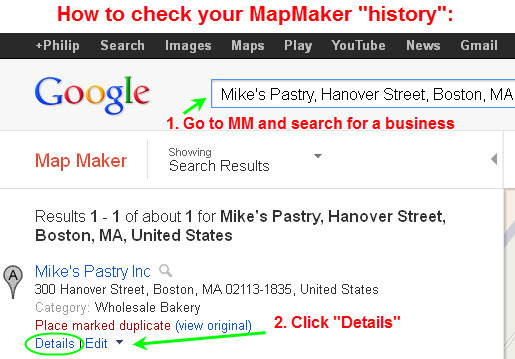 Too Many Donuts for the Google MapMaker Anti-Spam Cops? Google’s finest aren’t throwing the book at spammers. My client had gone back and forth with this slimy competitor over MapMaker edits and “Report a problem” requests, to no avail. That’s when I decided the least-inefficient option would be to contact Sheriff Dan. Dan reported the abuses. Then we contacted Google and got through to the right person. 1. They removed the descriptors from the Google Places business name(s). That was good. 2. They removed one of the spammy pages. Also good. 3. They converted one of the spammy pages into a non-local Google+ page, rather than nuke the page entirely (or merge it with the one legit page at the same address). That’s what Google temporarily – and I now know accidentally – did to a couple of my clients last month. Inadequate. 4. They let the sock-puppet reviews remain. Pathetic. Overall, the spam situation in my client’s market is much better than it was, because that one guy has had some of the wind taken out of his sails. But Google gave him 2 months with conjugal visits, when he should be doing 5 years in solitary. The sad thing is, this case got more human-review than others do. It’s not like we only went through the usual channels. It shows that Google has multiple contradictory policies (each Geo group handles the same data differently), little inclination to enforce their vague guidelines, and are more interested in hoarding and preserving data at all costs than ensuring the integrity of the listings. The absurdity is that you have to use extraordinary measures to get half a response. 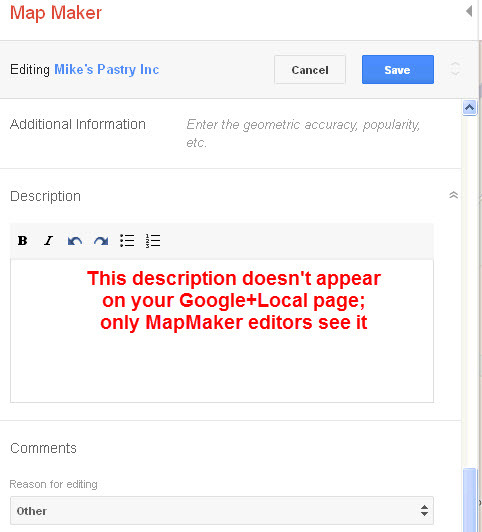 Using the normal reporting channels (MM “Report this”/delete, Maps “Report a problem,” Google+ Local “Edit details”) yielded no response at all! As I mentioned in point #3, Google didn’t remove one of the obvious spam pages, but instead kept it around as a non-local Google+ page. If they didn’t know about it or couldn’t do anything about it, even that meager change wouldn’t have been made. Although I suppose Google could still take harsher measures against this spammer and others, what we’re seeing is a reluctance to penalize obvious violators. Google could be cutting out the spam with a sword. Instead they wave a Play-Doh knife. Fortunately, spam battles like the one I described aren’t quite as common as maybe I made them sound. They’re not an issue for the vast majority of my clients, and they might not be an issue for you. What’s the spam situation in your market? What has / hasn’t worked for you? Leave a comment!